I felt at a disadvantage going to Bierhaus, the German restaurant on Queens Walk, with Ian, my stepfather. I don’t know a huge amount about beer – as anyone who’s ever read my reviews already knows – whereas he knows his way round a pilsner and a pale ale and used to work for one of the world’s biggest brewers, travelling all over the world and sampling all sorts. More significantly, he had been to Germany and I hadn’t. My knowledge of German stops at being able to ask my way to the town hall, proudly proclaim that I own a guinea pig or explain that my pen is broken (kaput, such a beautiful word). Oh, and I know how to tell people that my favourite pop group is Johnny Hates Jazz – although it never actually was, not even back then. I’ve had friends tell me how wonderful Germany is, how clean and beautiful, how everyone is handsome and polite and speaks beautiful English. It sounds like somewhere one could quite happily live, let alone visit, and yet Munich, Berlin and Cologne have never quite made it to the top of the city break shortlist (Berlin, in particular, crops up regularly with people I know, usually in the sentence Oh my god, you absolutely must go to Berlin: I don’t much like being told what to do, so I never have). I’m not sure why I’ve never made it out there. It could be repressed horror from those three years studying “Deutsche Heute” which mainly consisted of my schoolfriends making Franzi the Pig do awful, awful things through the medium of graffiti. But really I think it’s the food, which has never hugely appealed. I’ve never fallen over myself to try it, even to the point where I’ve always steered clear of the bratwurst place that crops up on the Oracle riverside every bloody year. Mystery meat? Nein danke. And the same goes for pork knuckle: who willingly eats a knuckle? As a result of my ignorance I have no idea, for instance, whether restaurants in Germany look like Bierhaus. My instinctive reaction, though, is that they don’t. The passage it sits on, near the Hexagon and the Penta Hotel, does have a certain under-the-Stasi feel about it, but that might be as far as it goes. There were some tables outside, which felt a tad hopeful in October, but the inside was more difficult to warm to. I didn’t mind the front room – designed more as a bar with its bright orange stools – so much but I found the upstairs dining room odd. It had dark walls, dourly functional tables and chairs and a leopardskin effect pleather banquette which was several kinds of fake for the price of one. Everything was quite poorly lit (possibly with the aim of making sure you didn’t notice the banquette) and strangely there was a tiny stage in one corner: what it was for is anybody’s guess. More random still were the enamel signs on the wall. Some were about beer, as you might expect, but many weren’t. There were also ones about coffee (All You Need Is Love And A Good Cup Of Coffee – haven’t these people heard of Toblerone?) and wine (Wine A Little You’ll Feel Better). Others were plain generic (Life Is Short Lick The Bowl, a mission statement which fails to stack up in so many ways). You could argue that their branding was confused, that they had strayed from their core concept. But really, it just felt like they’d got a job lot of these from TK Maxx and decided to go hell for leather and put them all up: a cosy wood-panelled room or snug bierkeller it wasn’t. It was around this point, where I looked at the menu and looked around me, that I realised that Bierhaus was quite a curious beast. I’m used to the phenomenon, out in the shires, of the Restaurant Disguised As A Pub. You know the sort of place – picture-perfect, hell-bent on getting into the Good Food Guide, always banging on about being the perfect local pub but completely unwilling to seat you unless you’re eating there too; Berkshire and Oxfordshire are full of the blighters. But until Bierhaus I’m not sure I’d ever seen the phenomenon in reverse. Because Bierhaus, make no mistake, is a pub disguised as a restaurant. It offers an extensive range of German beer on draft, nearly all of it at the five pound a pint mark, and it sells food but you order and pay at the bar. So far, so like Brewdog or Bluegrass, but at Bierhaus they genuinely don’t seem fussed whether you eat there or not. “It’s a really good beer list” said my Ian, who had got cracking on a very nice pint of Erdinger. My Dortmunder Union by contrast was a classic pilsner if a bit nondescript, although I may be saying that with hindsight because everything I drank after that was a bit more interesting. All the draft beers came as halves, pints or – if you really fancied going for it – steins. “Your uncle would like that” said Ian with a wry smile. It was true, although in fairness the only beer my uncle has ever really taken against is Kaliber: that aside, they’re pretty much all fair game. The food menu had a wide selection of starters and mains, and I noted that many of the starters were fried and much of the main courses were essentially meat and carbs (“It’s not a place for gluten-free vegans”, Ian said sagely, inadvertently turning it into a selling point). He also pointed out that the menu had changed since Bierhaus first opened a few years back, now offering the likes of nachos and wings to broaden the appeal. I also spotted a schnitzel salad, possibly the only dish to really offer what a close friend of mine likes to refer to as “garden”. Our starters were all very much variations on a theme, possibly more so than we’d intended, being three different things breadcrumbed and fried. I wasn’t expecting that – the cheese sticks were meant to be beer battered and frickles are usually battered too – but, for all that, I liked all three starters we ordered. The cheese sticks – no idea what cheese it was – were good fun even if they were Bavaria by way of Iceland, and I was prepared to overlook the three pointless strips of raw pepper they came with (the menu said they were served with peppers: rules are rules, I suppose). Ian said the frickles were the some of the best he’d had, and the coating on them had a surprising amount of kick. I had been expecting the thin crunch of a really good beer batter, but I found I didn’t mind its absence. And I really liked the sauerkraut balls – a Teutonic reimagining of arancini with a good contrast of sharpness and cheese. Ian was less convinced (“something more robust would have been nice”, he said – quite telling, as robustness was almost a calling card for much of the food). All three starters were at or below the five pound mark and came with either average tartare sauce, a rather interesting spiced ketchup or, in the case of the cheese, cranberry sauce. Oh, and those three strips of red, yellow and orange pepper – let’s not forget those. 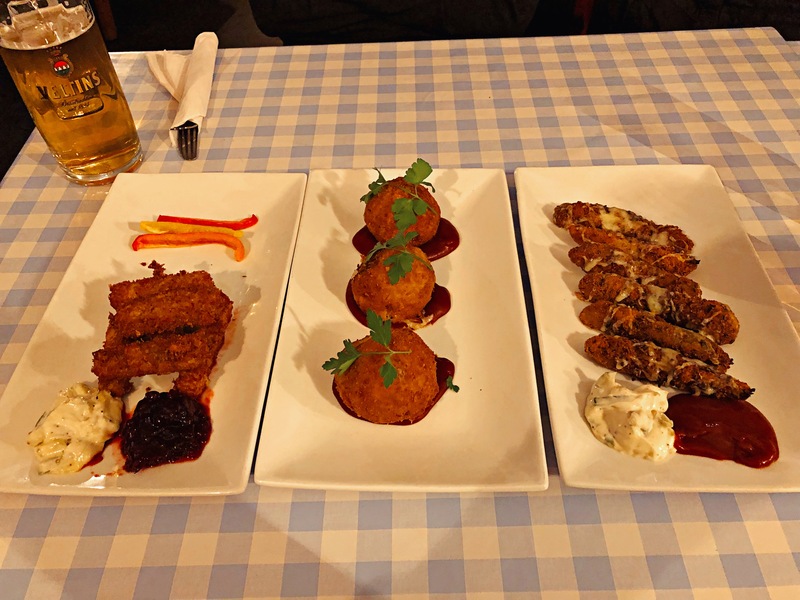 But the peppers summed up the slight disconnect here – Bierhaus is a pub and many of the starters were essentially bar snacks, so why the faffy arrangement and the rectangular plates? The very friendly waitress came and took our dishes away, her face almost ghostly through the application of industrial quantities of makeup. “What was the name of the daughter in the Addams family?” asked Ian, and for a moment I couldn’t remember whether it was Dienstag or Mittwoch. Another nice thing about the lack of fuss is that we felt completely unjudged ordering some nibbles, sitting there with our beers and taking our time to go up and order the rest. In the intervening time we both had a pint of Veltins, which I really enjoyed – it’s one of the more widely available beers Bierhaus does on draft but it was more complex and interesting than the Dortmunder Union. From there, Ian had a pint of the splendidly named Krommbacher (a sip tasted very nice indeed) and I moved on to the slightly fruitier and more delicate Früh Kölsch. Everything came in branded glasses, everything I tried was thoroughly enjoyable and I started to feel like I could well understand the appeal of a laid back evening trying beers, eating carbs and having a good old gas. The only thing I couldn’t quite shake was the feeling that it ought to be happening in a nicer room. Bierhaus felt quiet for a Friday night, and I wondered whether its time might be coming now that winter was round the corner. 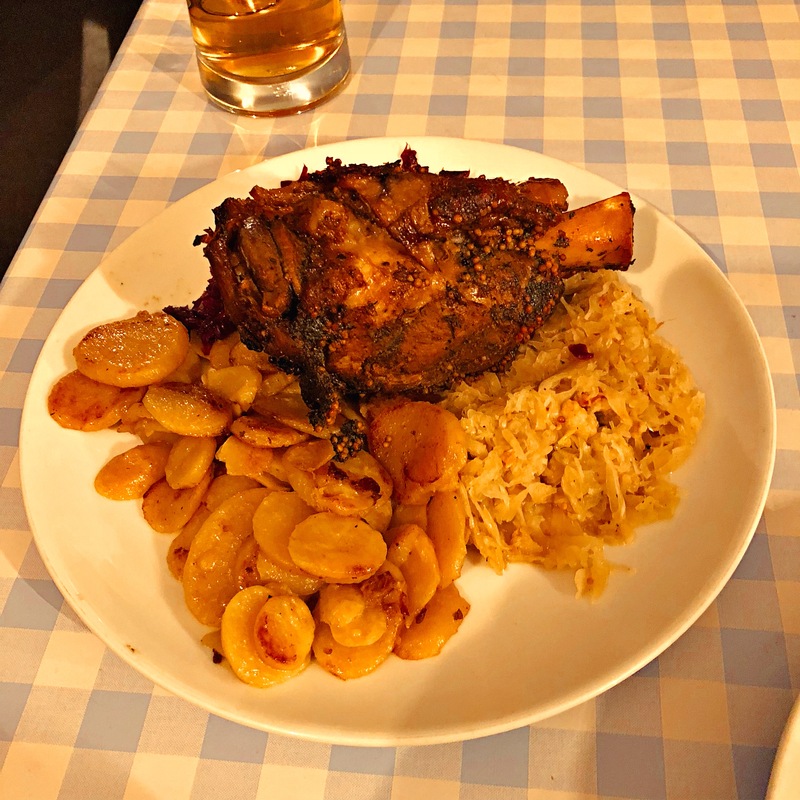 Ian had given me fair warning that he was going to order the schweinshaxe – the pork knuckle – but I never quite believed he was going to go through with it until he did. It was an enormous thing, more murder weapon than foodstuff, and he started to get to work on it with strangely appropriate efficiency. “I was psyched up for major surgery”, he told me later, “but it wasn’t necessary”. He was right: the meat fell away beautifully and tasted delicious. The outside was rich and sticky and covered in mustard seeds and herbs and all of it was very nice indeed (“not gelatinous or gristly” said Ian, summing up the two risks that had put me off ordering it). Would I order it myself on a subsequent visit? Maybe, although the price tag (eighteen pounds) was a little stiff and the accompaniments weren’t anything to write home about. 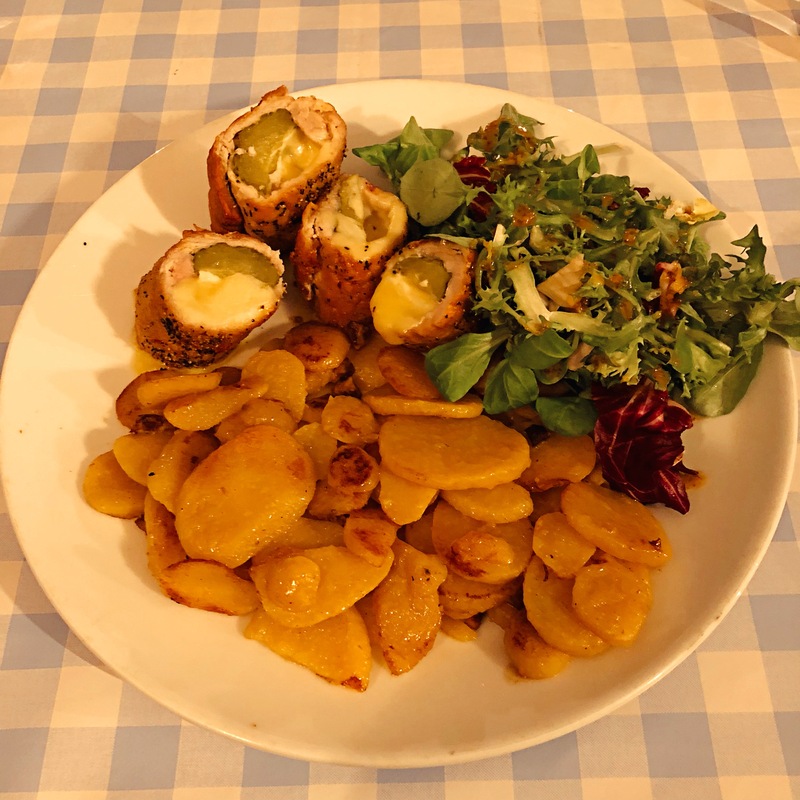 The bratkartoffeln – potatoes with bacon – were better described as potatoes with really not much bacon: it seemed churlish to complain when you were eating so much dead pig but even so they felt oversold. Not only that, but they had the oddly smooth texture of a long life product decanted from a foil packet rather than fresh potatoes fried in oil until everything was crispy and caramelised. There was more sauerkraut, which Ian didn’t like any more than in the starter, and some red cabbage. “Adequate”, he said, which ironically means it wasn’t good enough. I was tempted to pick the schnitzel or goulash, both of which I remembered enjoying from visits a few years back, but in the end I decided to try the “Bierhaus rouladen”, a pork escalope rolled and stuffed with cheese and gherkin. I thought this might prove to be, by Bierhaus standards, the diet option and I suppose it was: the pork was beaten very thin, and nicely seasoned, but the whole thing felt out of kilter because it felt like there was easily as much gherkin as pork. Now, I absolutely love a gherkin, but even I’m not sure I’d make them the absolute centrepiece of a dish (Bierhaus’ Instagram feed suggests that I may have got an especially mingey version, but even so). It came with a nicely dressed salad and more of those oddly waxy, largely bacon-free potatoes, and I didn’t mind it but I did find myself gazing enviously at the enormous ham shank opposite me more than once: the acceptable face of gammon, I reckon. We had a side dish of spaetzle: I’m pretty sure I’ve had spaetzle at Bierhaus on previous visits and liked it much more than this, but these noodles were fat, short, flat things with spring onion but little discernible cheese. We found it harder to finish than we did to pronounce, and that’s saying something. I did take a picture, but I’m doing us all a favour by not including it here. We passed on dessert – it’s a very small selection, and my stepfather is prone to describing beer as “liquid cake”, so I guess you could argue we’d had one already. Dinner for the two of us – starters, mains, the spaetzle and the grand total of six pints and one half – came to just under eighty-two pounds, not including service. Perspective is key here, because that might feel like quite a lot to spend in a restaurant but it doesn’t feel such a terrible amount to spend on sinking a few pints in the pub with a meal vaguely attached. I haven’t said much about service but actually, what there was was lovely and friendly and welcoming, both at the bar when ordering drinks and food and at the table when they brought our dinner over. When I started this review, I thought the biggest challenge would be avoiding hackneyed jokes about Germany: don’t mention the Fawlty Towers, you could say. But actually, now I come to write my conclusion the biggest challenge turns out to be deciding what I make of Bierhaus. Goodness knows, it doesn’t take long to reel off the minuses – it’s in a difficult and neglected part of town, the room is dark and lacking in atmosphere, the food is slightly lacking in consistency and you do have to really like beer (and possibly stodge). So far, so iffy. What might surprise you, though, is that I found myself liking it all the same. It really is an excellent selection of German beer, and I liked everything I had. The best of the food is better than you perhaps expect it to be – and, in fairness, I’ve had some nicer food on previous visits than I did on this one. The service is spot on, and I rather admire their pluck and the way they’ve carved out a space in Reading’s restaurant scene in just under two years of trading. They make a decent fist of using Instagram, something many Reading restaurants struggle with. And actually, despite what my stepfather said about the menu, they’ve gone out of their way to provide vegetarian and vegan options which strikes me as awfully progressive for a German restaurant (although that’s not to say that I’d personally order them in a million years). But actually, I think Ian, in his inimitable way, might have summed it up best. “The ambiance, the signage and the layout aren’t ever going to win it any awards”, he said, “but I’ve never had a bad time there.” And that, to me, says it all – because I’ve never had a bad time there either. It’s easy to get hung up on all the things a restaurant Should Be – an amazing room, flawless food, slick service, worthy piffle about provenance or plant-based dining – but actually restaurants are in the business of making sure we have a good time. And in some strange, almost amateurish, shouldn’t-work-but-somehow-does way which is beyond my powers of description, and against all odds, Bierhaus does precisely that.